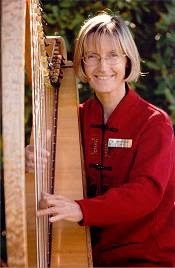 This website is designed to give you easy, affordable access to music for the lever (folk) harp. 50% are Alison's original compositions and 50% her arrangements of traditional music from diverse cultures. When Alison receives your payment she will email you a zip file of the complete album. You download the zip to your computer desktop, open it and print off the individual pdfs. If you would like Alison to mail you the printed music please pay an additional $8 for US/Canada destinations, $15 for elsewhere in the world. For printed music for Hammered Dulcimer try these albums! Each contain 13 varied and delightful tunes for beginner and intermediate players of the hammered dulcimer. 1. It's a harp. They're gonna love it. 2. They don't know if you make a mistake unless you telegraph it. Go on playing and smile. 3. Even if you do make a mistake and do telegraph it, they won't care. It's a harp. They're gonna love it. 4. It's just you and the music. The audience is a bonus, but it really is always just about you and the music. 5. Pieces you know that are not familiar are better choices than ones everyone knows every note of. 6. Noodling in the middle is perfectly acceptable until you can find your way back to the tune. It's called improvising. They'll think you did it on purpose, and since it's a harp, they're gonna love it. 7. Three tunes you could play in your sleep, played as a set, are the best friend you will ever have up there. 8. People aren't as tired of the old standards as you are. Go on, play "Greensleeves". On a harp, they'll love it. 9. The audience is on your side. They are not the enemy. They will always be far less critical of you than you are. 10. You are sharing yourself in a way few people do, and you have a right to be proud of that. And since you are doing it with a HARP....yes, you remember. They're gonna love it.